I love Fall, it's my favorite time of the year. It's not hot but not yet cold. We break out the sweaters, scarves, and boots. But the best part of Fall is all things pumpkin! I made these Rice Krispies treats last year when I found a host of Pumpkin flavored treats to mix together to make Pumpkin Spice Chocolate Surprise Rice Krispies Treats. The thing about making this recipe is that you have to keep your eyes peeled for the ingredients. They only come out during the heat of fall with the rest of the Pumpkin flavored goodies and some are only available at certain stores. Just think of me as the Pumpkin whisperer because I stalk stores for these items each year. Here are some Pumpkin favorites, some of which we used in our Rice Krispies Treats. 1. In large saucepan melt butter over low heat. Add marshmallows and stir until completely melted. Remove from heat. Add a dash of Pumpkin Spice. 2. Add KELLOGG'S RICE KRISPIES cereal and a handful (or a bag) of the M&M's. Stir until well coated. 3. Using buttered spatula or wax paper evenly press mixture into 13 x 9 x 2-inch pan coated with cooking spray. Cool. Cut into 2-inch squares. Another great way to eat these Pumpkin Spice Rice Krispies is to mold them into round Pumpkins and hide the Pumpkin Spice M&M's inside. 1. 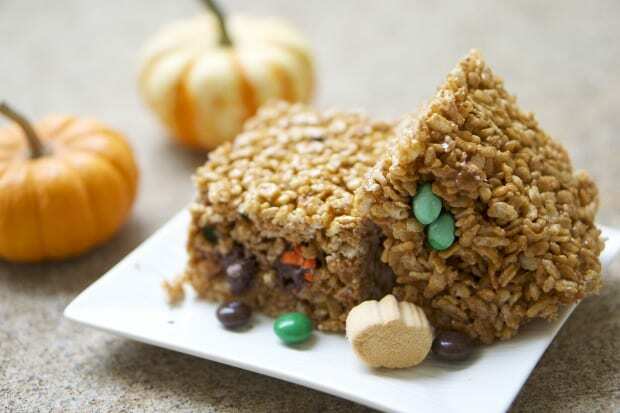 Make the Rice Krispies Treats from above but leave out the M&M's. Add a drop of orange food coloring into the mix with the Pumpkin Spice. 3. Pipe frosting onto each for vines and attach gumdrop for stem. Bam! 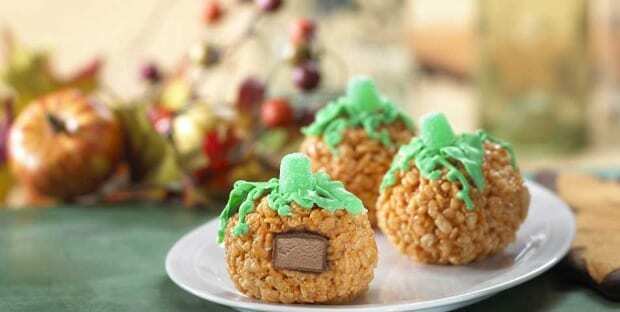 Not just cute Rice Krispies Pumpkins but they taste like Pumpkins also!